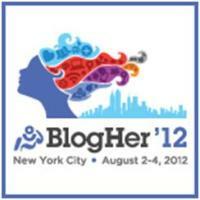 In a couple of weeks I'm heading to NYC for Blogher 2012. I went last year to San Diego. I had a great time-but every 'normal' conference I go to-I get overwhelmed. Take those conferences and multiply it by 10 and you have the MEGA of Blogher. Imagine this: 5000 women running around a) hugging b) listening in sessions c) whining that they didn't get 'the swag' or the gotta have party invite d) partying and e) ALL OF THE ABOVE. Last year, the last night that all the 'fun' was to be had-I was so stinking wore out that I went to bed at 8pm. My roommate, Kim from Mommycosm was out till WEEEE hours of the night...EVERY NIGHT!! Yeah. I TOTALLY can't hang. And although I already have a list of about 20 places I HAVE to be-I know good and well...that I'm going to be where I CAN. And know that it's ok if I miss something. For newbies and those that are returning-here's my Blogher Lesson Contribution! 1) Don't try to be SUPERWOMAN. If you find yourself starting to get run down (and YOU WILL, I promise!)... take a break. Go back to your room and close your eyes for 20 minutes. Go for a walk in NYC alone and take in something other than 5,000 bloggers. Find a manicure place or get a massage. Or even dinner alone or coffee. I promise that if you recharge yourself-you'll get so much more out of it all in the end. 2) EVERYTIME you get a business card-write where you met that person & what you talked about on it IMMEDIATELY!! Don't wait. Seriously dude. You'll come home with 500 cards wanting to rack your head against a wall and feel like you totally wasted your time AND LOTS of MONEY cause you have no idea where on Earth you met half the people and what you talked about! TRUST ME. It's VERY important. Brands and agencies will be BEYOND impressed when you reach out to them after the conference thanking them for the great insight and conversation. When you followup - be sure to mention a few things you talked about to remind them of your conversation. Cause TRUST ME. You think YOU'RE overwhelmed? They have 5,000 bloggers banging down their cubicle! 3) Take the time to visit every booth in the Expo. Last year when I was finally ready to step into that insanity-there was hardly any time left. I didn't even get 1/2 way around the floor. Set aside a couple hours every day to spend in there. If you see an brand that you want to talk to-MAKE THE TIME. And for crying out loud...DO NOT JUST ASK FOR SWAG. That will get you slapped upside the head faster than anything. CONNECT with the brands. If there isn't a rep available in the booth-walk around and see what they have displayed for yourself. Find out what the brand is all about. Then when you get the chance to talk to a rep-you sound like you did your homework. For some reason if you have to run and you don't get the chance to talk to one-be sure to grab one of their cards (write down who they are with and one great thing you noticed about the brand) and drop your card off with them. 4) FORGET ABOUT THE FREAKIN' SWAG ALREADY!! Seriously. This is a HUGE faux pas. You look like an IDIOT if you walk out of a party with 2 bags or an event with stuff pouring out your pockets. Yes. I'm the first to admit-that I've defintiely gotten some very cool stuff from conferences. Somethings that I was like 'whoa-never seen that before-cool!' But my biggest reason for taking the bags (when I do) is to THANK the brands in it. They pay a lot of money to get in your hands. And at Blogher they pay 10x more than 'a lot'. But do yourself a FAVOR. Don't pull any malarkey and tweet a brand saying 'can I have your swag' or 'can I have an invite to your party to GET your swag?' HELLO AMATEUR. Trust me. Brands and agencies have a 'Black Book of Idiot Bloggers' that they'll toss your name in for things like that. ENGAGE with them. THANK them. LEARN their names, twitter handles, addresses if you want to get to know them and work with them in the future. DO NOT ASK THEM FOR THEIR SWAG. 5) Make it a point to sit next to someone you don't know. If this is your 1st Blogher you likely don't know many people at all! But don't be afraid to grab lunch next to total strangers. You never know who you are sitting with! I remember my very first blog conference. It was Blissdom in Nashville. And I was pretty flustered the entire time. TOTAL newbie. I ended up sitting at table with just a few other women. Turns out I sat next to Katherine Stone from Postpartum Progress. She was completely what I needed at that time!!! I was just starting to come out of a dark place in my life where I didn't know much about postpartum. Other than the fact-I didn't know why I was such a basket case and was so frustrated with doctors because they kept throwing meds at me. I wanted to get to the ROOT of my sadness and learn how to cope in a healthy way and not self destructive habits (like eating an entire cake in the closet). If I wouldn't have sat next to Katherine and had the amazing conversation that we had. (We literally got kicked out of the lunch because they needed to set up for the next session!!!) I may have never truly found my heart and understood what I was going through. Katherine is an AMAZING woman. And she's done this for THOUSANDS of women. But you never know who you'll be sitting by. Another example: I stood up and shared my heart during a session last year at Blogher and afterwards an executive producer from ABC approached me talking about being apart of the ONE project. All because I stepped out of my comfort zone. I challenge you to focus on what you want to get out of it. Then make a plan on what will satisfy you when you reflect on your return trip. Do you want to meet more brands? Do you want to meet your favorite bloggers? Do you just want to get away from your family and see what blogging is all about? Only you know what you want. And I'm a prime example. If you want something- GO GET IT. It's yours for the taking. EXCEPT THE SWAG. LOL DON'T GO FOR THE SWAG!!!!!! What do you want to get out of BlogHer? What are your goals?